According to Transparency Market Research’s recent report titled “Pallet Racking Systems Market Global Industry Analysis, Size, Share, Growth, Trends, and Forecast Analysis 2019–2027,” the growth of awareness for organized warehouse space is expected to boost the demand for pallet racking systems during the forecast period. 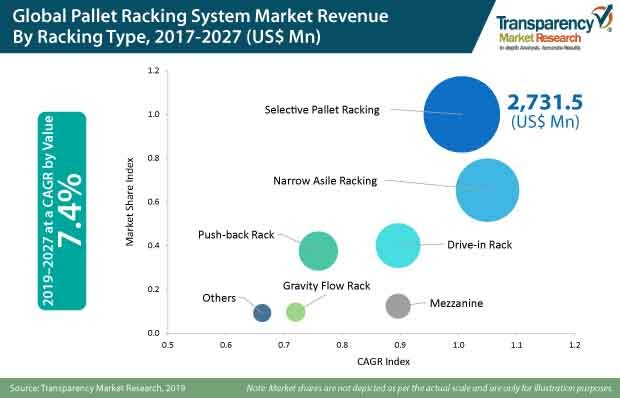 The global market for pallet racking systems was valued at US$7.8 Bn in 2018 and is projected to expand at a CAGR of 7.4%, during the forecast period (2019-2027). The global market for pallet racking systems is segmented by frame load carrying capacity, system type, racking type, application, and end use. In terms of end use, the pallet racking systems market is segmented into packaging, food & beverages, electrical & electronics, healthcare, metal processing & manufacturing, building & construction, chemicals, logistics & warehousing, mining, and others. The logistics sector is expected to grow at around 10-15% in the forthcoming years, largely due to growth in retail, E-commerce, and manufacturing sectors. This indicates that logistics demand will continue to grow and will create demand for large-scale warehouse spaces. Hence, robust growth in automation in warehouse space, coupled with rise in e-Commerce growth are cited to emerge as the key reasons for concrete growth in the global pallet racking systems market. According to an independent analysis, the total global market logistics in terms of value in 2017 reached about USS$ 7.2 trillion, which represent approx. 9% of the global GDP. In any economy, the logistics industry deals with the flow of products flow from place of manufacturing/origin to their consumption/end use. Logistics thus involves the amalgamation of warehousing, material handling, packaging and transportation, procurement, inventory & supply chain management, etc. These developments in the recent past have created a positive landscape for the pallet racking systems market. Increase in labor costs along with rising warehousing rents consistently over the last decade, have forced companies to utilize their warehousing /storage space more resourcefully. End users need to keep a sharp eye on these cost factors, which is giving impetus to pallet racking system manufacturers. Many products with space efficient storage systems, such as pallet racking systems, have been developed recently to address this need. In order to reduce labor costs further, automation is expected to continue to rise. Various end-use industries using warehouse automation revealed that more companies are willing to enhance or upgrade their existing warehouse management systems rather than implement new ones. Additionally, the demand for stand-alone subsystems and integrated ones is growing fast. Lastly, one of the key trends in the industrial market remains the movement of manufacturing operations to cheaper locations such as India, China, Mexico, Brazil, and Central & Eastern Europe (CEE). Logistics and warehousing play an indispensable role in the transportation of goods across the globe. A warehouse is a fundamental part of any business infrastructure and is one of the key enablers in the global supply chain. Subsequently, it is the fulcrum for procurement, manufacturing, and distribution services that collectively build robust economies. The growing need for organized logistics to improve time, cost, and quality efficiencies in emerging countries of Asian Subcontinent are propelling opportunities for the growth of the pallet racking systems market. Emerging customer segments such as E-commerce, present several unique opportunities for 3PLPs, owing to the rising demand for complete logistics management through the aggregation of vendors and services. Manufacturing companies of pallet racking systems must leverage this demand for new and differentiated services by suitably building capabilities. In 2018, Mecalux, S.A. constructed a new automated warehouse for Yamazaki Mazak in the U.K., which can store up to 60 containers weighing up to 500 kg each. In 2018, Mecalux, S.A. installed Movirack mobile pallet racking systems in the logistics center of F.lli Sabbini, Italy, which can hold up to 2,132 pallets of 1,100 * 1,100 mm with a maximum weight of 1,300 kg. In May 2016, the company Daifuku Co., Ltd. was ranked no.1 in the “Top 20 worldwide materials handling system suppliers 2016” by the U.S.-based Modern Material Handling magazine. In September 2017, the company SSI Schaefer expanded its product portfolio through cooperation with and investment in the Austrian AGV specialist DS automation. The global pallet racking systems market critically analyzed key players during the course of the study. These include Stora Enso Oyj, Georgia-Pacific LLC, Canfor Corporation, International Paper Company, Clearwater Paper Corporation, UPM-Kymmene Oyj, P.H. Glatfelter Co., Domtar Corporation, Mitsubishi Paper Mills Limited, Verso Corporation, BillerudKorsnäs AB, Burgo Group SPA, Twin Rivers Paper Company Inc., American Eagle Paper Mills, Delta Paper Corp., Catalyst Paper Corporation, Asia Pacific Resources International Holdings Ltd., Rolland Enterprises Inc., Alberta Newsprint Company Ltd., and Finch Paper LLC. In this report, Transparency Market Research offers an 8-year forecast analysis of the global pallet racking systems market between 2019 and 2027. The study reveals the dynamics of the pallet racking systems market in five geographic segments, along with market analysis for the current market environment and future scenario over the forecast period of the global pallet racking systems market. This Transparency Market Research report studies the global pallet racking systems market for the period 2017–2027. The prime objective of this report is to offer insights and key market trends pertaining to the pallet racking systems market that are gradually helping transform global businesses. The global pallet racking systems market report begins with the executive summary for various categories and their share in the pallet racking systems market. It is followed by the market background section which includes market dynamics, an overview of the global packaging market, TMR analysis of the market drivers, restraints, opportunity analysis, prominent mergers and acquisitions in the paper packaging industry, Porter’s Five Forces analysis, PESTLE Analysis of the U.S., Germany, China, Brazil, and India, macro-economic indicators along with correlation analysis, value chain analysis, cost tear-down analysis, pricing analysis by application, and trends that are affecting the growth of the pallet racking systems market. Furthermore, to understand the popularity of the various pallet racking systems segments, an attractiveness index and BPS analysis with elaborated insights on the same are provided, which will show the market’s attractiveness based on factors such as CAGR, incremental opportunity, and estimated market share in 2019. To show the performance of the pallet racking systems market in each country and region, BPS and Y-o-Y growth analysis are provided. The global market for pallet racking systems is segmented by frame load carrying capacity, system type, racking type, applications, and end use. On the basis of frame load carrying capacity, the global market is segmented into racking systems with frame load carrying capacity less than 5 tons (light-duty pallet racking systems), between 5 to 15 tons (medium-duty pallet racking systems), and lastly above 15 tons (heavy-duty pallet racking systems). On the basis of systems type, the global pallet racking systems market is segmented into conventional racking, mobile racking, shuttle racking, and hybrid & customized systems. The mobile racking segment is further categorised into horizontal rotating and vertical rotating. On the basis of racking type, the global pallet racking systems market is segmented into selective pallet racking, narrow aisle racking, drive-in rack, push-back rack, gravity flow rack, and mezzanine. On the basis of application, the global pallet racking systems market is segmented into cases & boxes, pipes & panels, tires, drums & pails, rigid sheets, timber & rolls, trays & crates, and others. On the basis of end-use, the global pallet racking systems market is segmented into packaging, food & beverages, electrical & electronics, healthcare, metal processing & manufacturing, building & construction, chemicals, logistics & warehousing, mining, and others. The next section of the report highlights the pallet racking systems market by region and provides the market outlook for 2019–2027. The study investigates Y-o-Y growth regionally, as well as analyses the drivers that influence the regional pallet racking systems market. The main regions assessed in the pallet racking systems market report include North America, Latin America, Europe, Asia Pacific, and Middle East & Africa (MEA). The report evaluates the present scenario and growth prospects of the regional pallet racking systems market for 2019–2027. To ascertain the size of the pallet racking systems market in terms of value and volume, the revenue generated by key manufacturers and their respective production capacities are taken into consideration. The forecast presented here assesses the total revenue generated by value, across the pallet racking systems market. In order to provide an accurate forecast, we initiated by sizing up the current market, which forms the basis of how the pallet racking systems market is expected to develop in the future. Given the characteristics of the pallet racking systems market, we triangulated the outcome on the basis of three different types of analysis- based on the supply side, downstream industry demand, and economic envelope. In addition, it is imperative to note that, in an ever-fluctuating global economy, we not only conduct forecasts in terms of CAGR, but also analyse the pallet racking systems market based on key parameters, such as year-on-year (Y-o-Y) growth rates, to understand the predictability of the pallet racking systems market, and identify the right opportunities across the market. The market segments for the global pallet racking systems market have been analysed in terms of basis point share (BPS) to understand the individual segment’s relative contribution to market growth. This detailed level of information is important for identifying various key trends in the pallet racking systems market. Another key feature of the global pallet racking systems market is the analysis of key segments in terms of absolute dollar opportunity. Absolute dollar opportunity is critical for evaluating the scope of opportunity that a provider can look to achieve, as well as to identify potential resources, from a delivery perspective of the pallet racking systems market. The overall absolute dollar opportunity along with the segmental split is mentioned in the global pallet racking systems market report. Transparency Market Research has developed the pallet racking systems 'Market Attractiveness Index'. The resulting index should help providers identify real market opportunities. In the final section of the pallet racking systems market report, a 'dashboard view' of the companies is provided to compare the current industrial scenario and their contribution to the total pallet racking systems market. Moreover, it is primarily designed to provide clients with an objective and detailed comparative assessment of key pallet racking systems providers specific to a market segment. Pallet racking systems report audiences can gain segment-specific manufacturer insights to identify and evaluate key competitors based on an in-depth assessment of their capabilities and success in the pallet racking systems marketplace. 20+ key players operating in the global pallet racking systems market were critically analysed during the course of the study, which include Daifuku Co., Ltd., KARDEX AG, Interroll Dyanmic Storage., Jungheinrich AG., SSI Schaefer, AVERYS Group, Mecalux SA., NEDCON B.V., Estral Innovation and Applied Logistics, Dexion Gmbh., Montel Inc., Hannibal Industries, Inc., Elite Storage Solutions Inc., Ridg-U-Rak Inc., Atox Sistemas De Almacenaje, S.A., Vertice Diseño S.A., Poveda & CIA., Frazier Industrial Company, DR Storage Systems, Storage Equipment Systems, Inc., Gonvarri Material Handling, Stöcklin Logistics de México, AR Racking, Proman S.R.O., and AK Material Handling Systems.